I’ve always been a massive fan of Hillsong Young & Free. So when my friend Ian Reid reached out to me about working together on a music video for their new album, I was thrilled. I knew it would be a project to remember. Looking back, I’d have to say it was probably the most grueling production stories any of us will have to tell for quite a while. But the final product so worth every moment. Here’s a bit of the story behind the process of bringing this one to life. Ian Reid has become a good friend over the past couple years. He’s an incredible filmmaker and DP, and I’m truly grateful we got to work together on this project! He is ridiculously talented and brought such a polish to the ideas and shots in this piece! As with any project, the initial conversations between the 2 of us included lots of ideas that never quite saw the light of day (including a “Hot Rod” style dance sequence with a series of jump cuts throughout a small desert town). But surprisingly there were a couple core ideas that we both had in the first phone call that made it all the way. I loved this because it’s not everyday that 2 different people with 2 very different perspectives have the same initial idea coming into developing a treatment. After listening to the song a number of times, the core concept we both felt would win was this idea of weightlessness - pulling from the lyrical theme of letting go. We knew we wanted to create the feeling that the laws of physics and time were beginning to fall away. Initially our hope was to have Aodhan in a harness and rigged to either a large crane or helicopter. And while that could have been a great experience, looking back, I’m actually quite glad we had to figure out another solution. As our conversation evolved, Ian and I also loved the idea of shooting on multiple formats. 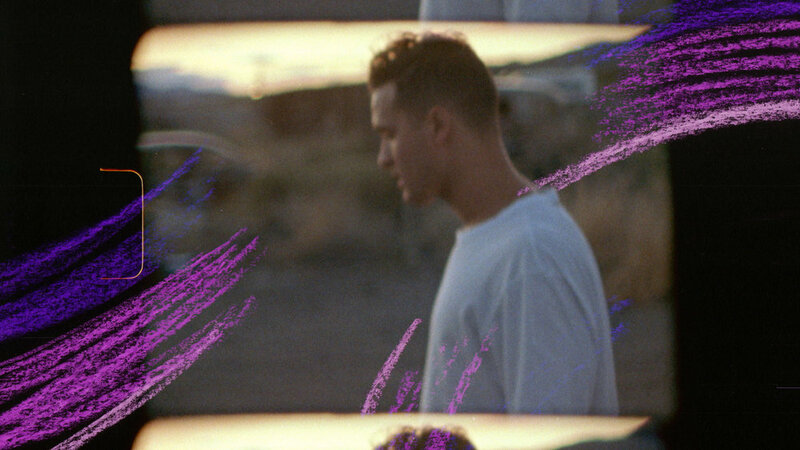 From the beginning, we wanted the visual choices and aesthetic of the piece to also compliment the idea of “letting go” - as if the video itself was breaking all the rules. And it was this idea ended up leading us to the solution of how to pull off Aodhan’s floating shot we had concepted by directing us away from harnesses and towards a Phantom high speed camera, a pile of crash pads and mattresses, and some VFX 101. For lenses we had a set of Leica Summicron-C and a 50mm Kowa Anamorphic. For lighting we tried to keep it to a bare minimum - both for budgetary and transport reasons. Ian used a 4x4 bead board for the majority of the shoot just to help reflect natural light and create fill where necessary. 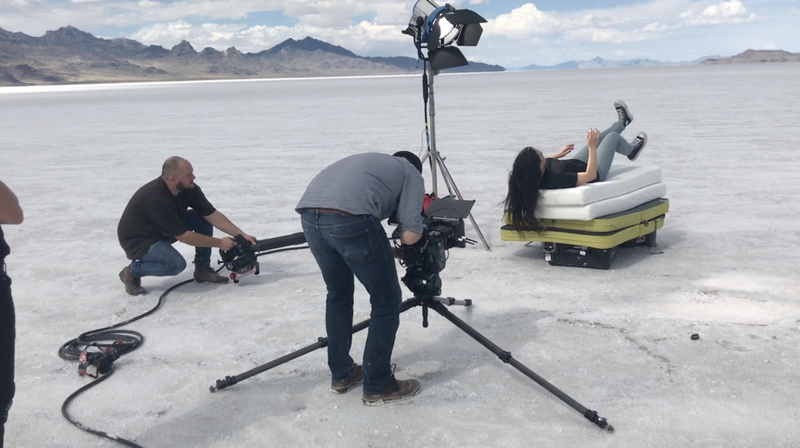 For some of the close up slow motion floating scenes, he brought out a M18 - specifically thanks to his research regarding the high-speed ballast it came with allowing us no shutter issues shooting at 1000fps. And finally for the strobe sequences set at night, we used 2x Skypanel S60’s set opposite each other. We had some initial direction from Hillsong Y&F manager and producer Johnny Rays about a location that complimented the theme of “oasis” that the lyrics also hint at. (Originally the cover art direction was aimed at a similar theme). So we discussed finding a desert with some sort of natural pool, etc. Funny enough we chose our final destination - the Bonneville Salt Flats outside of Salt Lake City, Utah - because of all the pictures we had seen of gorgeous reflective pools of water out in the middle of the stark landscape. But when it hasn’t rained for a while, those images don’t happen quite as easily. That said, by the end of the project, we all ended up loving the contrast that it created to not have the water element in the visual. The Salt Flats are an almost alien-like landscape. AND the area is considered public land which made production quite a bit easier. Neither Ian or I had ever been to Salt Lake City before, so we arrived 2 days before to make sure we knew EXACTLY where we were going. We had a lot to pull off with a quite a limited amount of time with the band, so we knew careful time budgeting was a must. Also, because we wanted to shoot with natural light as much as possible, we wanted to find out the best time to be at each location to make the most of the sun. Let it be known that this video was pulled off with a total crew of 4 people (myself and Ian included). I knew we would need to keep our crew small to make travel easy. But I also wanted to make sure we had a couple guys out there that we already had a short hand with. We needed to be ready to work hard for a long time. And we needed to be friends. So I called the best of the best - my best friend (and incredible filmmaker) Paul Trimble and the best producer/gaffer/Swiss army knife I’ve ever met, Kirk Slawek. These guys absolutely crushed it the couple days of the shoot. They were always 3 steps ahead of Ian and me, and honestly the project may not have happened the way it did without them. Ok so finally the day arrived to pick the band up from the airport and get to work, and from the first moments we were all having a blast. These guys are the funnest hang ever! We grabbed some lunch, let the guys settle in to make final wardrobe choices for a second, and then we headed to our first location. We were lucky to find 3 pretty iconic feeling spots (tattered billboard, graffiti bus, and abandoned desert town) all within a few hundred yards of each other so it made for an easy first half day! I’ll note here that the first moments of any shoot (in our case day 1) are all about getting to know each other and settling in to the weird world of making a music video together. It requires a lot of vulnerability to sing and dance on command with people you’ve only just met. So the goal for good directors and crew members is always to help set up an environment for that vulnerability to be normal. We tried to have a lot of fun and get as goofy as we could as quickly as possible. And here came the beast. 3am lobby call to begin the 2 hour drive to the Bonneville Salt Flats from SLC (the band was thrilled). There by sunrise. Shot til 10pm that night (with a small lunch break - yes, McDonalds was our best option in the middle of the desert) before making the 2 hour trek back for whatever food was left open in SLC and to dump footage. I believe we were finally wrapped and in bed by 1am - 22 hours total. But what a day! The whole team killed it and we felt really excited about the magic we were able to capture. Highlight of the day definitely had to have been Ian hanging out the left side of the minivan with a Movi in his lap with Paul driving 50 mph in a circle around Aodhan and Karina, Kirk wedged between seats pulling focus, and me watching monitor and screaming directions blaring music through the open windows. All with the backdrop of one of the most stunning sunsets we’d ever seen. The next day, we pulled ourselves out of bed, did our best to remove all the salt and sand from the rental vehicles, and headed for the airport to get home and jump straight into the edit. We had about 5 days from wrapping production to get the final colored picture lock turned in. I took the lead on the edit and began processing footage and prepping timelines as soon as we got home. - A great performance is the foundation for this kind of video, so I always want to make sure I can easily pick and choose between takes as quickly as possible. Essentially I take every shot with singing or dancing specific to the timing of the song and line those all up to have easy view of all options. Ready for the not so glamorous answer? Our “floating” sequence was achieved by having Aodhan and Karina jump backwards onto a pile of crash pads and baby mattresses we ordered on amazon. We filmed them with the Phantom high speed camera (1000 frames per second) set completely static on the ground. Then, making sure the camera didn’t get moved at all, we removed the mattresses and crash pads and shot an empty plate of the ground. The final thing that really made this edit special was being able to tie into the single artwork that the Y&F team created. The scratchy, almost child-like sketches were yet another element that added to the concept of letting go. With the tight turnaround time, their team’s artist wasn’t able to deliver additional sketches to us. But luckily, I’m married to a ridiculously talented creative genius who discovered an amazing new skill set of creating the hand-drawn elements you see in the video. She sketched with crayons, markers, and colored pencils. And then we scanned and inverted them and used them as texture throughout. All in all, this project was one of my absolute favorites I’ve ever been a part of. Loved getting to hang with the Young & Free guys and can’t wait for more collaborations to come! Hope you’ve enjoyed a small peak behind the curtain. Please send me any questions you may have! I always love getting to chat with people about process, challenges etc!